Blue light filter selection is complicated. A blue filter may help you with many problems: computer eye strain (computer vision syndrome), LED & fluorescent light sensitivity, sleep disorder, age-related macular degeneration (AMD), light sensitivity (discomfort glare), visual acuity… But not every blue filter will produce optimal results given the specifics of your blue light sensitivity problem. The chaos of hype marketing terminology often hides more than it reveals which further complicates the selection process. Read on to find out: which wavelengths your blue filter should absorb/block, by how much, how to compare bluelight filters.. The two properties are first explained to derive the decision criteria. Then several blue filters are evaluated. To filter, block or absorb light are used interchangeably as synonyms to denote the proportion of light not transmitted (passed) through a filter. If a filter transmits x% (e.g. 40%) of light, it filters/blocks/absorbs 100%-x% (e.g. 100%-40%=60%). Conversely, if a filter blocks/filters/absorbs y% (e.g. 20%) of light, its transmission is 100%-y% (e.g. 100%-20%=80%). Disclaimer: My interest in blue light is due to my problems with light sensitivity (photophobia), discomfort glare, and computer eye strain. I am not a vision scientist. Disclosure: I would like you to know that if you use some of the links below and purchase a product I earn a small commission at no additional cost to you. If you wish to support GLARminY, use the links containing text: Disclosure: commission link. You may also “give” a small percentage of anything you might buy from Amazon by accessing Amazon through this link (Disclosure: commission link) at any other time. Thanks for your help. Enhancing performance while avoiding damage: A contribution of macular pigment (2013). To avoid repetition citations to these two reports (but not others) are avoided. Light avoidance or pain (discomfort) we feel in excessive brightness is our protective mechanism against light damage, particularly AMD. Within the visible part of the electromagnetic spectrum (wavelengths from about 400nm to about 700nm) the principle “troublemaker” is short wavelength light (violet and blue light) from about 400nm to about 500nm. It is usually referred to simply as blue light. The natural countermeasure to these undesirable effects of blue light are two intraocular blue filters. The crystalline lens shields entire retina from most of the light below 400nm (violet and UV light). Its absorptive capacity falls sharply to near 0 by about 450nm. 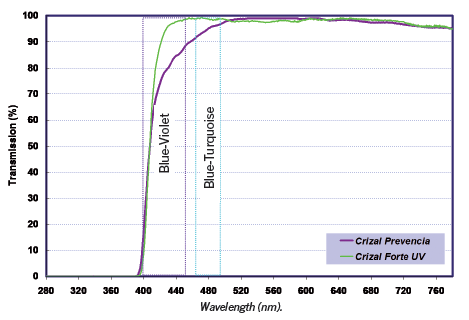 Our natural, intraocular blue filters: Macular pigment and Crystalline lens spectral absorption curves. Adapted from (The visual effects of intraocular colored filters; 2012). The second blue filter is more interesting from the perspective of blue light sensitivity. Macular pigment protects only the macula, a tiny area (about 1%) of the retina, where our vision is sharpest and where our retina is by far the most sensitive to light induced pain. 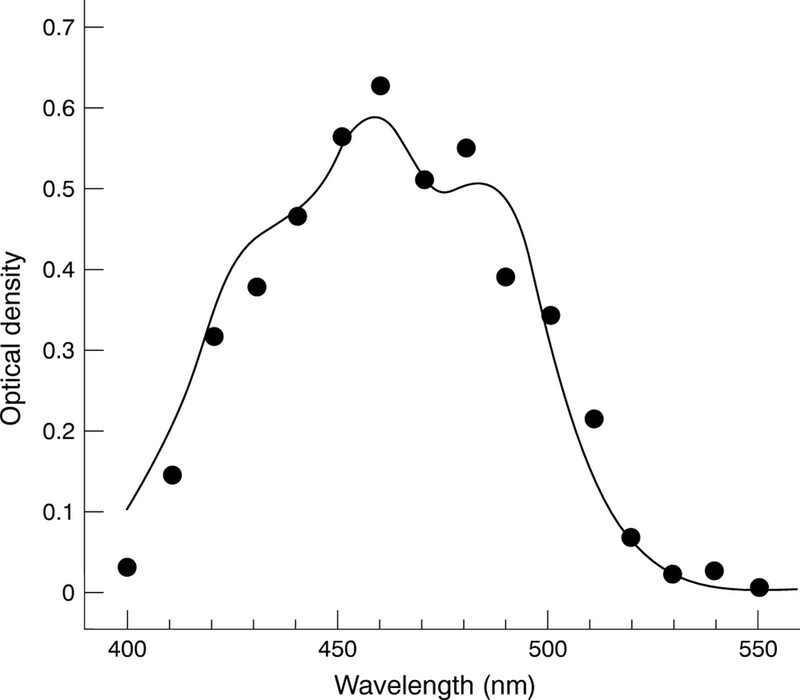 A healthy macular pigment peak absorption is ~460nm and filters blue light considerably from ~440nm to ~480nm. Outside these boundaries its absorption relatively quickly drops to 0 (see image above). If you are having problems with (blue) light sensitivity your Macular Pigment Optical Density (MPOD) – its blue light absorption effectiveness – may be too low, principally due to diet. An external blue filter is an obvious solution to low MPOD. It brings several benefits: reduction of intraocular scatter, lowering of glare discomfort (photophobia) threshold, improved photostress recovery and glare disability. However, a major drawback to external blue filters is the loss of input to photoreceptors (they have less light to “work with”) which may be critical in low-light conditions. Macular pigment covers only the photoreceptors for day vision (bright conditions) at the macula (principally long wave – L and medium wave – M cones). Conversely, an external blue filter shields all of the retina, including the photoreceptors (rods) for vision in low-light conditions, which are most sensitive in the upper blue light and green range (~440nm to ~540nm). Hence unlike macular pigment an external blue filter considerably reduces input to night vision photoreceptors. This is the principle reason why tinted lenses/glasses are discouraged for night driving. It is also why improving your macular pigment through diet (or dietary supplementation) is the preferred solution over a longer run. A recently patented Wertheim Factor summarizes well all of the above. It was invented to facilitate blue filters comparisons. Wertheim Factor represents the fraction of the damaging high-energy spectrum blocked by a filter compared to the visible transmission of the filter. The resulting figure ranges from 0 to about 0.5. A high Wertheim Factor indicates a filter that blocks well in the UV-violet-blue range while also transmitting well in the green-yellow-red range that is most easy to see and least damaging to the photoreceptors. Unfortunately there is currently only one vendor – Reading Glasses ETC (Disclosure: commission link) – that supplies Wertheim Factor data for their blue filter lenses. If your blue light related problem is sleep, than your blue filter decision criteria will be slightly different. Blue light is used by our brain to adapt our sleep-wake cycle to day-night cycle (for more info, view explaination by a leading scientist). Until very recently in men’s evolution this worked reasonably well, because sun’s light was the only source of intense light, blue light in particular – see below. (The only environments that did not facilitate sleep of sufficient length and quality were areas far from the equator with late sunsets and early sunrises in summertime). However, the developed world has become less sleep-friendly due to the widespread adoption of light sources with relatively high blue light intensity. Light-emitting diode (LED) and fluorescent bulbs have become very common light sources, some of them with very high blue light content (Levels of visual stress in proficient readers: Effects of spectral filtering of fluorescent lighting on reading discomfort; 2015). Moreover, in the evenings, just before bedtime, we increasingly use LED digital display devices: computers, TVs, smartphones, tablets… (Blue blocker glasses as a countermeasure for alerting effects of evening light-emitting diode screen exposure in male teenagers; 2015. Protective effect of blue-light shield eyewear for adults against light pollution from self-luminous devices used at night; 2016). As shown below the sensitivity of melanopsin (the receptor of non-visual information related to sleep/wake cycle) peaks around 480nm, is high between ~430nm and ~520nm and practically 0 above 550nm. Filtering blue light up to these wavelengths should help you go to sleep faster (if you are an evening type) or sleep longer (if you are a morning type). Adapted from: (On seeing yellow: The case for, and against, short-wavelength light–absorbing intraocular lenses; 2012). Block sufficiently (depending on your sensitivity) wavelengths near 480nm (±40nm); (Use only 2-4 hours before bed time. Such blue filter will considerably reduce your low-light vision – see spectral sensitivity of Rods above). Using the same blue filter for light sensitivity as for sleep disorder might be an overkill. Similarly, a 0% blue light transmission (blocks 100% of blue light) up to a certain wavelength might be an overkill – unless you’ve determined you have highly blue light sensitive eyes. The table below should help you gain an understanding of how to evaluate blue filters. For demonstration purposes, an LED source (Thinkpad T440s at 6500K CCT) and a fluorescent source (Westcott CFL at 4500K CCT) were chosen. Click on images, to enlarge. Data source: fluxometer – many more options of filters, light sources and related data available there). The filters are ordered roughly according to color distortion (from less to more) and mostly also from lower to greater blue light absorption. Note that the background on spectral diagrams changes: it approximately shows what white looks like through the given blue filter. Comment: Spectral power distribution (SPD) curves above are reproduced in the images below (black) for ease of comparison between unfiltered and filtered SPD. Transmission: At 460nm – High; At 480nm – High; VLT: ~98%. Suitability: Minimal blue light protection. Filter: iLLumiShield Screen Protector. Transmission: At 460nm – High; At 480nm – High; VLT: ~86%. Suitability: Minimal blue light protection. Filter: Tech Armor RetinaShield Blue Light Filter Screen Protector. Transmission: At 460nm – Moderate; At 480nm – Moderate; VLT: ~62%. Suitability: For migraine, blepharospasm & fluorescent light sensitivity**; For moderate sleep disorders. Filter: Axon Optics FL-41 light sensitivity/ migrane relief glasses (indoor lens). Transmission: At 460nm – Moderately-high; At 480nm – High; VLT ~97%. Suitability: For non-glare/light sensitive; Not for sleep disorder. Filter: Gamma Ray computer/gaming glasses. Transmission: At 460nm – Moderate; At 480nm – Moderately-high; VLT ~96%. Suitability: For mildly-glare/light sensitive; For minor sleep disorder. Filter: Gunnars (computer, gaming and prescription Rx). Transmission: At 460nm – Low; At 480nm – Moderate; VLT: ~92%. Suitability: For more glare/light sensitive; For minor sleep disorder. Filter: 3M safety glasses. Transmission: At 460nm – none; at 480nm – none; VLT ~69%. Suitability: For more glare/light sensitive; For severe sleep disorders. Filter: LowBlueLights eyeglasses. Transmission: At 460nm – none; at 480nm – none; VLT ~47%. Suitability: For more glare/light sensitive; For severe sleep disorders. Filter: Melatonin Shades. Transmission: At 460nm – none; At 480nm – none; VLT ~51%. Suitability: For more glare/light sensitive; For severe sleep disorders. Filter: UVEX SCT Orange safety glasses. ** FL-41 tint was designed initially for fluorescent light sensitivity and has also been shown to alleviate Migraine and some Benign Essential Blepharospasm symptoms (Diagnosis, Pathophysiology, and Treatment of Photophobia; 2016). TheraSpecs (non-commission link) is another company that offers FL-41 tint on their migraine relief and fluorescent light sensitivity eyeglasses. You can also buy TheraSpecs on Amazon (commission link). Spectral transmittance may be found here. or recur to intuitive colorimetry (particularly if you feel that a blue filter doesn’t help you – your vision might be asking you to filter out different wavelengths to feel comfortable and avoid visual stress). The most obvious characteristic of blue filters is their color: yellow, amber, orange, red, brown… But, for the purpose of reducing blue light induced problems, despite appearing similar in terms of their color appearance, different filters may have dramatically different absorption characteristics (The visual effects of intraocular colored filters; 2012). 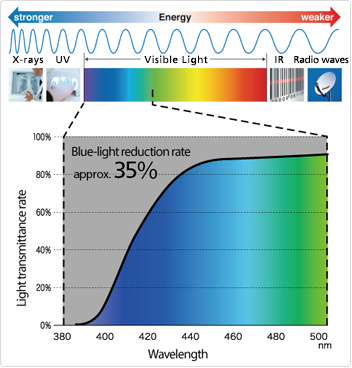 For some filters (particularly sunglasses) there is no other information provided but % of Blue Light Transmission (BLT) and % of Visual Light Transmission (VLT/LT). For example in the image the Grey filter’s BLT is only 15%! But its VLT is also 15% such that it only makes things look darker, without selectively reducing the intensity of blue light reaching your retina more than other wavelengths. Conversely, Amber/Melanin filter lets trough 5 times more light than blue light. If you have nothing else but these two figures, stick to the rule BLT < VLT. There are many more blue filters available on the market than the ones featured above. Several more options with significant information about their transmission properties are available in these posts: computer work related blue filters, outdoors and driving (including polarized sunglasses). Ps: If you found the post How to pick the best blue filter for your light sensitivity problem useful, please consider LIKING, REBLOGGING, and/or SHARING it. I am a Registered Nurse and read a phamplet while taking my son to his eye doctor appt. and is what has led me to your wonderful site. I wanted to do some research on the best blue light protector to buy for all of my families devices including my husband who sits in front of a computer all day at work. As I continued reading, I became even more confused, as there is an enormous amount of information here. Toby/TIA – hi and thanks for your comment! From what you mention (you are in it for prevention) it seems that you could all be fine with a good blue light app (Iris/f.lux), Reticare screen protector (links are provided in the above post), or most glasses in this table (the more protection from blue light you want, the higher up in the table you go – but going too high may be an overkill and may also cause issues with reduced contrast). I got Prevencia prescription glasses for my first prescription (have astigmatism) and they made me dizzy and nauseous. Kept seeing blueish artifacts. I went back to my eye doctor and he is switching them to regular Crizal lenses and he said they offer some blue light protection although Crizal says they don’t. I have 2 pairs of Gunnars but the magnification is not strong enough although I find the Amber tint soothing. $300 for the prescription glasses, I’d like to actually be able to use them! Steve, dizziness and nausea are often a “negative side effect” to blue light filters when their spectral transmission doesn’t adapt well to your visual system. – Big prescription change especially with astigmatism. – Glasses not adjusted properly. Especially with high astigmatism and progressive wearers. – PD (Pupilary Distance) not correct. – Dr’s Rx not correct. – Glasses over contact lenses, etc. Spectral transmission characteristics of the filter can also cause nausea, which may be why you find Gunnars‘ tint soothing, but not Prevencias’ – the difference in spectral transmissions might not seem that big (see below), some/many? people may not notice any difference, but in your case it is obviously enough to cause dizziness and nausea. Judging from the feedback I get (and from my personal experience) this negative side effect is entirely subjective. The only way to really know if a tint will work for you has been to try it. In this article you can read about the three options you have for trying different tints. The most recent one has been GLARminŸ Tester, which lets you try 8 different blue light filters and then helps you identify the closest matching (in terms of spectral transmission) commercially available filters. The good news for you is that you know that Gunnars’ tint works for you. You may refer to this table – the filters you find close to Gunnars (above or below) have similar spectral transmission properties, while those that are further away differ more. The bad news for all those who need blue blockers with prescription (which is not the most common) is that the choices are very few. For example, Gunnars‘ does offer prescription glasses, but within some limits – and for you those are obviously too tight? Thank you for such an in dept article. Very helpful. thanks for your kind words and your question. I’ve learned (and science confirms this experence) it is impossible to predict what filter will work for any given person. Until we have a robust predictive model (won’t be very soon), there is no substitute for trying a filter. This article suggests the alternatives you have to figure out what filter might work best for you. I am a programmer and i play video games the rest of the day. Which eye glasses do you recommend to me? i was thinking to buy some Gunner glasses or some Hoya lentils. Radu, hi. Thanks for writing! The more issues you have with blue light (see this link to find out), more of it you want to block. It sounds like you are concerned about your visual comfort, but you don’t have any serious eye strain issues (yet?). Gunnars might be a good option for you. (I don’t know what is the spectral transmittance of Hoya lenses). Anyhow, I also recommend you see the article on best blue blocking glasses. You’ll be able to compare spectrograms. I decided to take Hoyalux iD WorkStyle V+ with Hi-Vision LongLife BlueControl. But I don’t know if blue light is reflected or absorbed. Is Hoya a good choice? Horned, hi. Thanks for your comment. You might find the answer to your question in the latest post on Best blue blockers in style and light filter specs. Hoya BlueControl is a coating that reflects blue light. Blue blocking capacity is minimal, but that may be enough depending on what your problem is and how sensitive you are to blue light. Nice. I also got one pair of blue light blocking glasses. So far so good. Hi, I have just learned I have early onset Macular Degeneration and need to assure that I get the right glasses – avoiding blue light and UV & being sure my money is correctly spent. My optometrist hardly spent anytime with me after reviewing my opti-map so this is all new ground for me. I VERY much appreciate your site and would like to know your opinion as I am a little confused from what I have read here so far. My optometrist office made no mention at all of the choice: Smart Blue Filter. ***the sample lens attached to a piece of cardboard display is purple-blue in color & I could not take it outside to see the blue metal reflection on the inside. This color made me ? it too, since I am supposed to be avoiding blue light & now they want to give me glasses with a blue-purple lens to look through…??? 3) Wouldn’t a coated lens degrade over time more easily with cleaning, etc. vs one where it is built into the lens? 5) Would I still require an interior coating if I used Noviolens, IF this lens does not cause a worsening in Mac Deg? Per above: ”Noviolens was developed to absorb all of the UV and much of the HEV, while reflecting very little of either.” How much High Energy Light is absorbed as this sounds perfect for Mac Degen? How do I get this lens offering – I am in Concord, NC. 6) Please give me your best suggestions…and I will be happy to contact you directly as well. Thank-you very much for posting. M, thanks for stopping by, for your kind words and very good questions. I haven’t spent any time researching Macular Degeneration nor the specific transmission properties of the glasses you mention in your questions. Also, I haven’t been able to find any spectral transmission data related to the brands you mention. So, I appologize, but I cannot make any specific recommendations/suggestions. You are taking MP supplements aready. I hope it helps you strengthen both MP functions. In terms of (2), which is what you are after with blue light filtering glasses, my best guess is that a spectral transmission of anti-AMD glasses should resemble spectral transmission of MP (the cryatalline lens seems to be less of an issue – it tends to become yellow with age, such that it absorbs more HEV light, not less like MP). (Image source: Macular pigment and age related macular degeneration; 1999). Hence, your glasses should absorb (filter) blue light significantly between 430-500nm and particularly so around 460nm. (Although, such a spectral absorption curve may also be due to other MP functions that are not related to macular degeneration, for example vision quality). By how much? I haven’t found an answer yet – I am guessing nobody really knows. Besides, it probably depends. 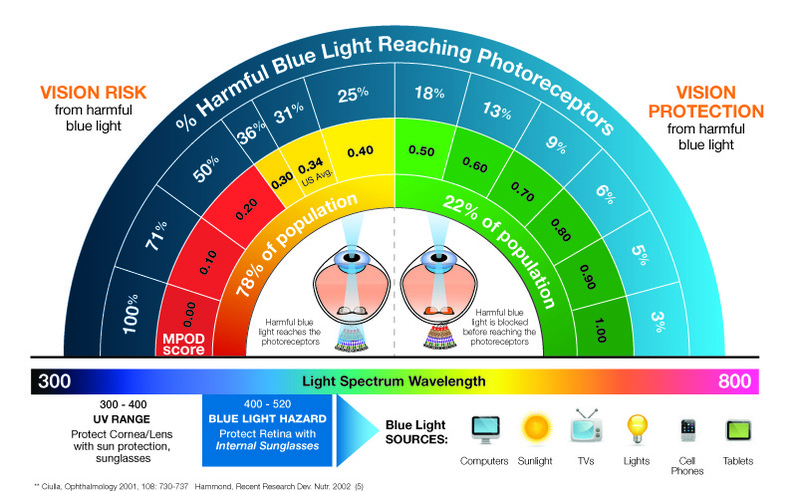 According to the infographics below, less than 50% of blue light should reach the photoreceptors in your macula. Hence, your new glasses + your crystalline lens + your MP should filter 50% of blue light or more. Therefore, depending on spectral filtering characteristics of your lens and MP the 20% absorption (+20% reflection) you mention may or may not be enough. And let’s hope that much of those 20% (normally given as the average from about 400-500nm) is concentrated near 460nm. For example, the lens below filters on average ~35% of blue light, but only about 10% near 460nm. 1) Given the issue of UV and blue light reflecting back into the eye mentioned by FoggyEyes, I would go for absorbing lens, particularly if you plan on wearing the glasses also outside. But the lens will look tinted (probably yellowish), not clear. Note that such a lens might also absorb only 20% of blue light. 3) Your reasoning makes sense, I don’t have any data for that, though. 4) Yes, the remaining blue light still reaches your eyes. You may go for glases with near 0% transmission up to 500nm, though (apart from their orange tint and color distortion) the biggest inconvenient is important loss of low light vision (see also leaflet below). 6) if you wish to write to me directly, please use the contact page. I just remembered one more thing you might find useful: This therapeutic tints leaflet gives an indication of what spectral transmission BPI, a leading company for lens tinting equipment and supplies recommends for Macular Degeneration treatment. See top four spectrograms – second and fourth probably meant for sunglasses. In the first (yellow tint) they suggest 0% transmission up to ~460, i.e. filltering ~85% of blue light! Or even 0% transmission up to 500nm (the third spectrogram) namely blocking blue light entirely – as you implied in your question 4). I decided to take zeiss duravision blue protect or crizal prevencia. But after reading the issues explained by foggy eyes related to reflection of UV from back of the glass into the eyes i am really confused about which glasses to buy. Is is really beneficial to buy blue light coating from these brands?As what’s the use if they reflect UV rays back into the eyes. Please help and give some suggestions. Duravision blue protect and Crizal Prevencia block blue light in the same way: blue light is reflected by a coating (not absorbed by the tint in the lens). So with either you run into the same problem, but note that it happens only when the light is comming from behind you. You might want to check the post on Best blue blockers, before deciding. Another one that might help you make your decision is on How to pick best blue light filter for your light sensitivity problem. FoggyEyes, Uroš, I do agree. The video was very interesting. It is surprising to me that big lens manufacturers like Zeiss and Essilor did not take this into account in developing these coatings. For regular AR coatings, having the AR on both sides is good as it reduces reflections, making the lenses much clearer to see through. My guess is that they simply missed the bad aspects of having the blue block AR on the back. It’s a shame to because these coatings are priced ridiculously high. Hopefully they will correct the issue. I should add that the 2 blue block AR coatings that I offer are front surface only. Both Mojo BluBlock AR and Apex BluBlock AR-T! [commission links, added by GLARminY]. FoggyEyes, Uroš, here is an update on what Essilor is doing with some of their lenses regarding blue filters. They recommend adding a Crizal AR coating. There are several versions of Crizal AR including the Prevencia, a blue light reflecting AR. All Crizal AR coatings are dual sided coatings. So, the Prevencia coating reflects off 20% of blue light and the lens itself filters 20%, which sounds like a pretty good solution for most folks except for the possibility that the back side coating would reflect blue light back into your eyes. Smart Blue Filter is available on certain Essilor single vision lenses and their Varilux Progressive Digital lenses. Steve, thanks a lot for this update! I recently got Zeiss blue-filtering lenses for my computer glasses. I didn’t experience the instant relief that I was expecting. Moreover, at least one optician has expressed concerns that lenses that filter blue light reflect more UV light into the eye from behind the wearer, meaning the UV light hits the back of the coated lens and reflects back into the eye. He has a convincing video on youtube that shows this. I’ve experimented unsuccessfully with f.lux for word processing: as the app increasingly reduces blue light, it also darkens the screen and reduces contrast, forcing you to increase screen brightness to compensate. So far still no great solution to the problem of computer vision syndrome. I feel that the real culprit is the screen itself and that manufacturers should be forced to address this major health issue, since extensive exposure to computer screens is required of millions of workers and students. In this day and age many people cannot simply opt out of dangerous screen exposure. Recent studies are uncovering young people in the twenties with macular degeneration! FoggyEyes, Are you are referring to the Zeiss DuraVision BlueProtect coating? The blue “blocking” anti-reflective coatings like that work by reflecting off blue light (usually to about 470nm). These coatings “pull” all other light into the lens. Now, in most cases, the lenses are polycarbonate or a high index material and those materials filter UV to 400nm. The combination of the coating and the lens material do protect your eyes from UV and the most damaging blue light. They may not “feel” like they are doing anything because they are clear. Blue block tinted lenses work by absorbing blue light to varying degrees and the tint colors can provide greater contrast or dampening of glare. They also change the screen colors you are looking at. I think that for most computer users, the blue block AR coatings are a great solution. Issues related to glare, brightness, and insomnia may be better addressed by blue block tinted lenses. Btw, can you post or send me a link to the video you mentioned? Yes, I mean the Zeiss DuraVision BlueProtect coating, not tinted lenses. I’ve had them for about three weeks now and I think my eyes might be feeling a bit better now. I had to get used to an astigmatism correction at the same time. The optometrist who is expressing concern about increased UV reflection from behind the glasses is William Stacy in Caifornia. Here is an opticians’ forum thread that discusses this problem: http://www.optiboard.com/forums/showthread.php/62102-Essilor-s-Prevencia-vs-Hoya-s-Bluecontrol. He states, “Unfortunately, reflection from the back surface is very bad on all these lenses, reflecting not only visible blue but also UV radiation into and on and around the eyes.” He has created lenses called Noviolenses. His website is http://www.noviolens.com/. I would love to hear your assessment of this issue. Apparently the central question here is whether the back of the lens has the blue-block coating. FoggyEyes, thanks a lot for bringing up this important issue – I’ll make sure to include it into the bodies of related posts. – blue-reflect coating: lenses that reflect blue light into wearer’s eyes must be a terrible thing outdoors and in brightly lit offices, not only producing veiling glare (ghost shadow) on the lens that reduces contrast, but (under certain circumstances) they also defeat the purpose of filtering blue light (and UV light), unfortunately. – lenses that absorb blue light: blue light filtering is based on the absorption of blue light by the tint used. Blue light is absorbed (not reflected) whether it is comming from the front or the back of the lens. – blue-reflect coating: one sees a blue reflection of the lens – make sure you check both sides, for example against blue sky. Steve, wouldn’t you agree? … and thanks for your valuable comments! I am just wondering if you know much about blue blocking lenses and photophobia?? Hi Samantha. I have been an Optician for 30 years. I have been researching and developing my own line of blue filtering glasses and I have consulted with research physicists, optometrists, and ophthalmologists in developing these products. We have many very happy customers. There are several things that concern me about how many people view blue light and blue block products. 1. People think that all blue light is bad and it’s not. 2. Photophobia is not just a “blue light” issue. Some people have other vision and health issues that may or may not be related to blue light. For example, certain types of medication can have an effect on light sensitivity. Diabetes, high blood pressure, even pregnancy, can have an effect on vision and light sensitivity. Certain lens tints can address vision issues related to health problems like brain trauma for example, that have little to do with blue light specifically. 4. Many people like visual artists need clear vision without color distortion (tint) but still need protection. For people suffering from photophobia, SAD, insomnia, and glare related CVS issues, a proper blue block tint is in order. By proper, I mean a lens tint that addresses their particular issues without being too intense and annoying to see through. Lenses with synthetic melanin infused can help with some issues if worn during the day and some blue filtering lens tints can work better at night. I view all of these lenses as “therapy” lenses in that they do not just protect your eyes, they fill other needs as well. My advice as always is to see your Eye Doctor first.